Home › Ontario › Hamilton › Pest Control Services Near Me in Hamilton › All-Pest Control Services Inc.
About All-Pest Control Services Inc.
All-Pest Control Services Inc. is the pest control company of choice for Hamilton. For more than 25 years, All-Pest Control has provided pest management services to customers in Southern Ontario, including Burlington. Certified, licensed, and trained technicians, including entomologists with Ph.Ds, offer residential, commercial, and industrial pest control services. Their proactive approach focuses on prevention and solutions. Products Carried: All-Pest Control Services Inc. provides comprehensive pest management throughout the GTA and Southern Ontario, including Hamilton. 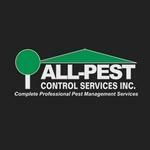 All-Pest Control offers the best available technology and best practices in application. They are experts in all facets of pest control, from insect identification to wildlife, bed bug, and mosquito (West Nile Virus) control. Give to All-Pest Control Services Inc.
You will receive updates from All-Pest Control Services Inc.